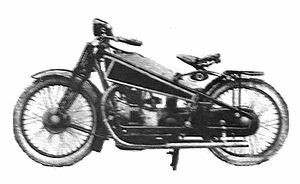 Finzi and Maxima (Fabbrica Nazionale Motocicli Maxima, later Officine Meccaniche Carminati), based in Voghera, presented the new Maxima motorcycle at the 1923 Salon that very closely resembled a motorcycle by the English company ABC. The engine had two cylinders in a V-cutting frame, with an angle of 36 °, 598 cc, overlapping valves (with the exhaust in the head) and head reported. The clutch was housed inside the engine flywheel and a three-speed gearbox. The frame was cradled in a tubed frame, the leaf spring saddle with a front fork suspension and a chain driven transmission. Finzi production ceased in 1925.